Ever since I was a very little girl, music has been in my home. There was never one exclusive type of music either, we always had a ton of genres. I think between my mom and dad there has to be hundreds of records, cassettes (90s kid, heyy! ), and CDs in my house. R&B. Blues. Rock. Reggae. Jazz. Country. Soul. Calypso. Soca. Pop. etc. So much, and I was exposed to all this from birth I think. I was always just a tad partial to that R&B and Soul. But I loved it all. 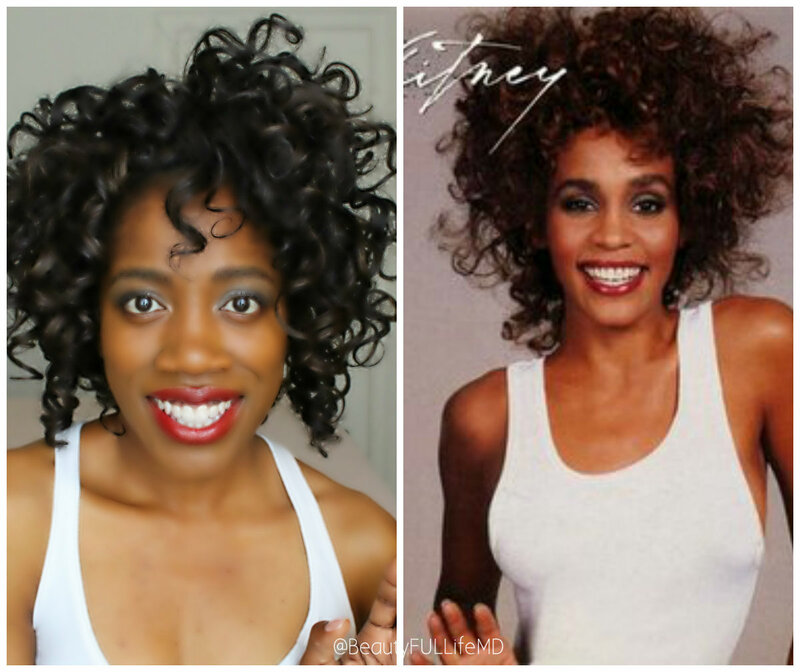 I don’t know which of my parents loved Whitney more. But I remember this CD so well, it played often. This CD is sadly long gone from this house as someone borrowed it and never returned it. BUT, I still love it to this day, nevermind that the themes and lyrics were way above my little head, not like I even understood it. LOL. I just loved the music. 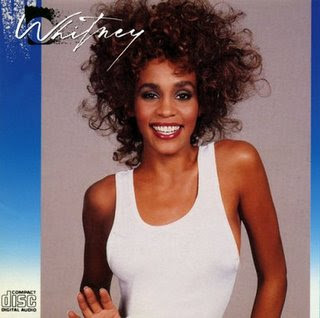 And Whitney was SO beautiful. This is the earliest music I remember hearing from her even though it was her second album, but I’ve loved her since. She’s one of my absolute favourites. Her birthday was August 9th, and to honor her powerhouse, out of this world vocal talent and iconic, classic beauty, I decided to recreate a few of her earlier looks. Mostly from the late 80s, early 90s. Here goes! I started with the album cover that started it all for me. It was really difficult to see the colours she used on her eyes, but I think I got something like it. I feel like it all came together once I got the hair done. Brushing, teasing and backcombing. Ha! But so fun. 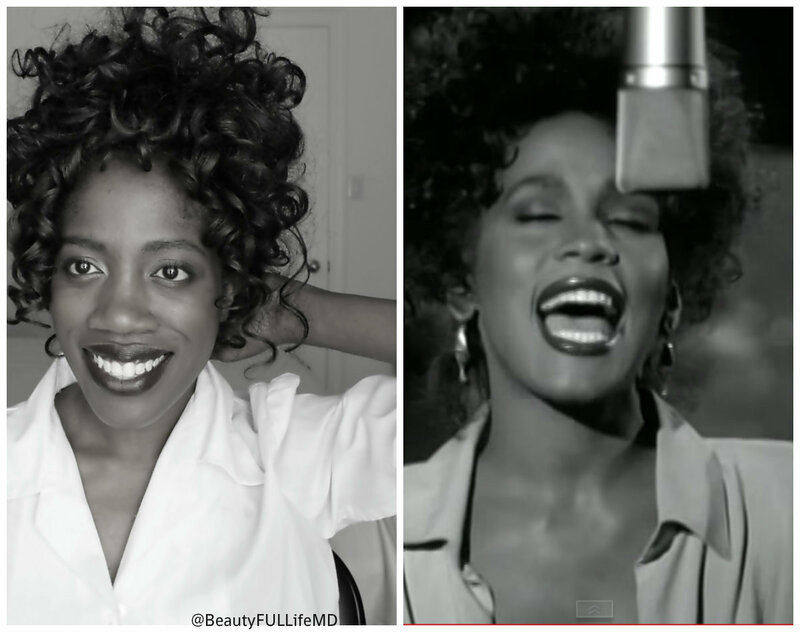 I know I’m not Whitney Houston, but…I felt like I was with the hair and makeup, and I could hit those notes for real. Lol, not the singing, but this is as close as I could get to the look though! Sticking with this album, I chose to do this look from her music video for “Where Do Broken hearts Go?” She looked so beautiful throughout it, but this is my favourite scene. Doing what she did the best. Singing her heart out. I think I nailed this one pretty well. It wasn’t hard, everything was pretty natural looking with a bold lip. As always, the hair always brings a look together. Took it back a little further with that vibrant 80s colour pop. 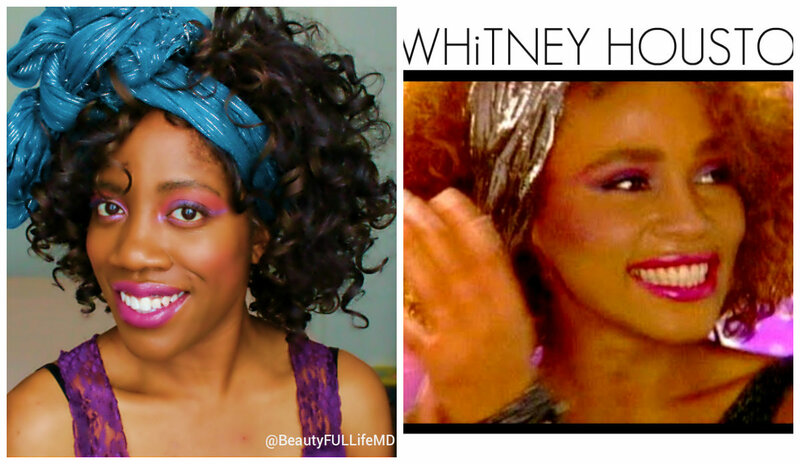 I couldn’t do Whitney without doing one of these looks. This is from her music video for “How Will I Know”. It was between this and “I Wanna Dance With Somebody”. But I didn’t have a blonde wig, so this one won out. Haha…I enjoyed it still even though there was no blending allowed. But that pink lip! 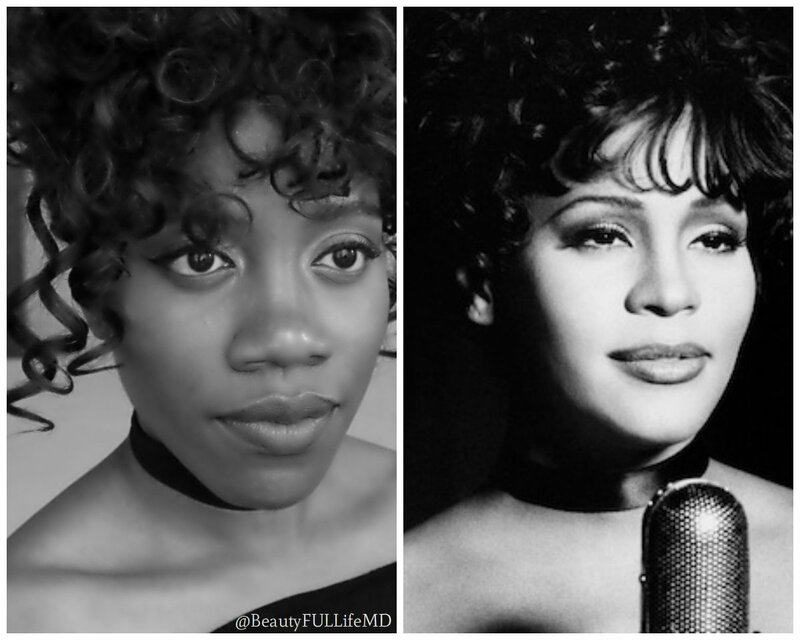 Whitney definitely had a signature look. I figured this out as I was watching more and more of her videos. She seemed to like brown tones and short curly hair. And it fit her really well. One of my favourite songs inspired this look. “I’m Every Woman”. Very simple, very classic, very 90s. The choker, the brown lipstick. This song always reminds me of her! And that’s all I had time to do! But it was so fun, taking a trip down memory lane with one of the greatest voices ever. Didn’t hurt that I got to dive head first into my makeup, it was a ton of fun trying to recreate these looks. This is a scary question for me, but…how did I do? Be gentle, it was my first time doing my makeup to look like someone else!